The great (and only) literary manifestation of Vorticism, the short lived English art movement. Two art book size magazines published a year apart, the first breath of modernism on our island shores. Showing some influence from Futurism (especially Marinetti's Zang-tumb-tuuum) and arising about the same time as Dada but distinctly London based. Wyndham Lewis called his baby 'the puce monster' and most copies unless hopelessly tarnished still have that Pepto Bismol puce that must, in 1914, have been to current art like Punk Rock was to popular music in 1977*. The English are not given to manifestos but this is what a manifesto shoud look and sound like. At first sight it seems totally original but there are precedents for the look of the thing in 19th century wall posters, proclamations, evangelical tracts and the style of electioneeering handbills and circus and theatre adverts. For the benefit of Mr. Kite etc., The 1914 issue has articles, and poems by Wyndham Lewis, Ezra Pound, Ford Madox Ford, Rebecca West, Edward Wadsworth, Gaudier Brzeska, illustrations by Edward Wadsworth, Wyndham Lewis, Frederick Etchells, William Roberts, Jacob Epstein, Gaudier Brzeska, Cuthbert Hamilton and Spencer Gore. 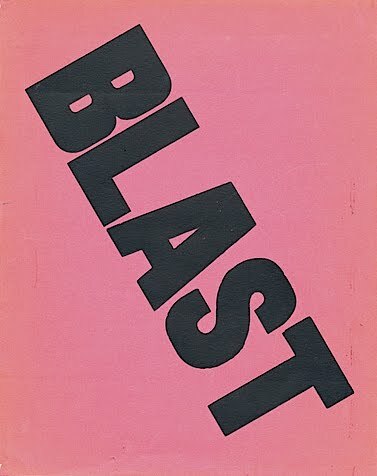 Blast was a direct attack on Victorianism, Salon Art, the Georgians, English snobbery, French especially Parisian art, English humour ('putrefaction of Guffaws') 'cosmopolitan sentimentality', 'feeble Europeanism' and the nascent Bloomsbury Group inter alia, advocating in their place abstract, geomentic and mechanical elements in art, and precision and concision in poetry. The Imagist school of poetry had some of the same members and is closely related. The implacable Lewis would return to satirising and attacking the Bloomsburys in 'The Apes of God' (1930). VALUE? Even distressed and lived in copies especially of the puce issue go for £200. Fresh, bright and clean sets are blasted rare and can make over £2000. A reasonable copy with some palpable wear is on sale in Ireland at £450, we moved a half decent slightly restored 1914 copy on the mighty ebay at about $1100 in 2006. The first issue is more vulnerable than the second, it is also more desirable. It's the puce. There is a very interesting set on sale at present which were Lewis's own copies and although in somewaht bohemian condition are priced at $6500. A very good reprint came out in the 1980s from Black Sparrow with a third issue in homage and even a record. Ubiquitous lines of silly little trees. Large empty cliques, higher up. Bad air for the individual. * In fact there was something of a revival of Vorticism at this time with a coterie based in Fulham loosely known as the Neo-Vorticists who produced the fanzine 'Dat Sun' which blasted and blessed current London figures such as Malcolm McLaren, Emperor Rosko and Monty Modlyn. Now highly uncommon.